bluminerals is BleachBright's exclusive remineralzing gel. Introduced in November of 2012, we are the first to launch this revolutionary product. If you whiten your teeth, then bluminerals is a must-have to protect your investment. Want to know why? Read below. After whitening, the tubules (pores) of the teeth remain open and can easily absorb stains after eating or drinking. 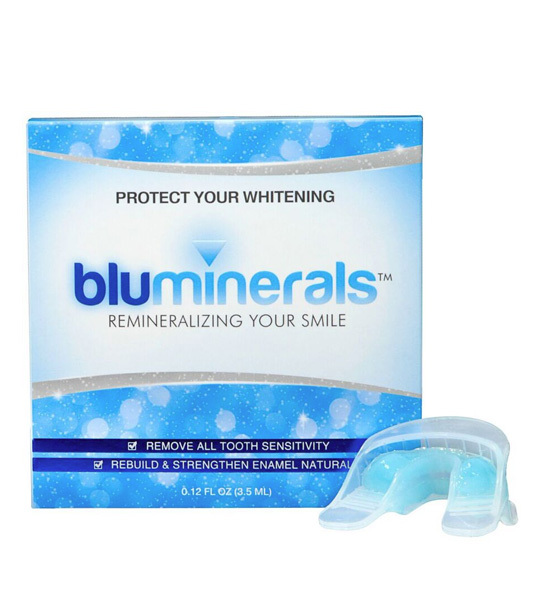 bluminerals seals the pores of the teeth to prevent staining and maintain your teeth's new sparkly white color. Peroxide can sometimes cause tooth sensitivity in some people. If used after an L.E.D. whitening, bluminerals eases tooth sensitivity by using potassium nitrate. If you suffer from sensitivity when you whiten your teeth, then this product is for you. Teeth experience enamel loss whenever someone eats or drinks. bluminerals contains sodium fluoride to help rebuild and strengthen tooth enamel naturally.